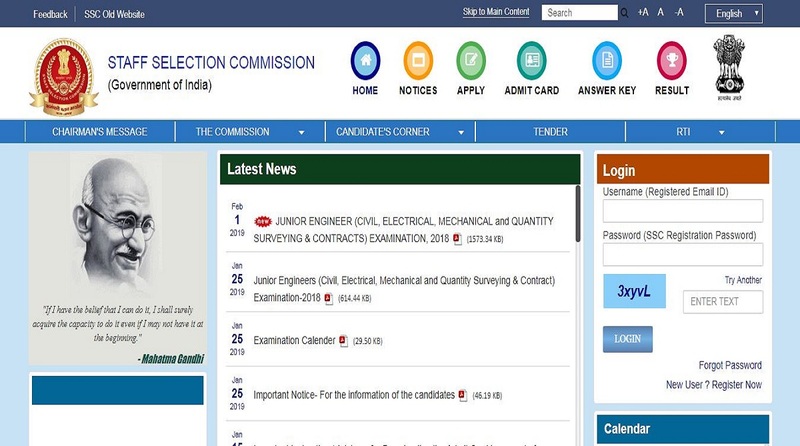 SSC recruitment 2019: The candidates who want to apply online for Junior Engineer posts should do from the official website- ssc.nic.in by February 25, 2019. SSC recruitment 2019: The Staff Selection Commission has released the notification for Junior Engineer posts. The candidates who want to apply online for Junior Engineer posts should do from the official website- ssc.nic.in by February 25, 2019. • The candidates should read the official notification for information about age limit as they differ for every post. • SC/ST/PwD category candidates do not have to pay the application fee. • The Examination will consist of two Papers i.e. Paper-I (Computer Based Examination) and Paper-II (Descriptive Type). • The Paper-1 will be objective type and will consist of General Intelligence and Reasoning, General Awareness and General Engineering (Civil & Structural) or (Electrical) or (Mechanical). • The duration of the exam is of 2 hours. • The Paper-II will be descriptive and will consist of 300 marks in a total time duration of 2 hours.